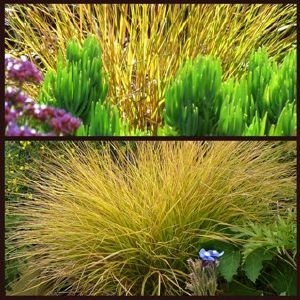 In summer this ornamental evergreen grass is streaked orange-brown and it then turns to orange brown all over in winter, when there may be less to catch your eye in the garden. The narrow, flat or inward rolled leaves are dark olive green for the rest of the year. It has a pleasing overall arching habit with interesting purple-green flower spikelets that hang down, almost touching the ground, from midsummer to early autumn. The seed-heads that follow provide a winter food source for finches and other seed-eating birds. Don't be put off growing it if you have a heavy soil. Easily grown in average, medium to dry soils, in full sun or shade. Does well in heavy clay soils, unlike many other ornamental grasses.